Hosts, the indigenes, in whose city we had been graciously allowed to build Embassytown, were cool, incomprehensible presences. Powers like subaltern gods, which sometimes watched us as if we were interesting, curious dust; which provided our biorigging; and to which the Ambassadors alone spoke." Embassytown is classic science fiction with something to say about Earth by imagining what language, consciousness, communication and colonization might be like at the edge of the universe. The 2011 science fiction novel Embassytown begins like yet another unimaginative science fiction story, using calendars with dates like "the third sixteenth of September, a Dominday" and sentences full of invented terminology like "Very few cartas were granted, to civilians, or those of us with the aptitudes to traverse the immer out of sopor." But bear with it. It slowly, very slowly, gets creative and thought-provoking. Spoilers follow, because it's hard to compliment this work without giving away details, and it's also likely that the spoilers just might keep readers from giving up on this novel too early. We're used to reading science fiction about encountering aliens whose intelligence matches or even greatly surpasses humans. But the "Hosts" in this story are harder to read. They appear to be intelligent, but they also are treated like colonies of primitive peoples in Earth's own history. Their language is particularly difficult to decipher. They have two mouths which speak simultaneously, which leads to humans creating "doppels", like twins, who learn to speak in tandem, to act as ambassadors in communicating with the Hosts. Complicating things further is that the Hosts don't really communicate via sounds at all, but more like empathically. They make sounds like speech, but the sounds don't carry the message. This distinction is expressed by calling their language "Language" with a capital L.
Empathic communication carries a particularly threatening implication for Hosts. Humans tell lies by thinking one thing and saying another. Because thinking and communicating are one and the same for Hosts, what they think is what they say and what they say is what they think. That means that they have a congenital inability to lie. The Hosts gradually begin to sense this difference between themselves and humans. Their efforts to overcome their "handicap" leads to a spreading contagion like a drug addiction that threatens apocalypse for their world. The novel then settles down into a standard end-of-the-world battle between the forces of the old and the forces of the new. 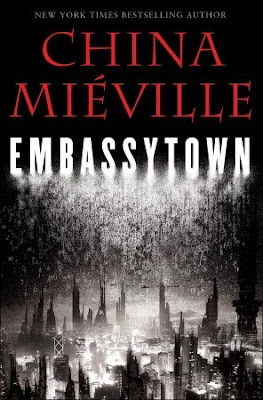 But by then China Miéville's really interesting contribution to the genre is already made. China Miéville's take on language shows how language can shape intelligence and vice versa.